07 Jan 2019 --- US-based light protection specialists Noluma International has released new evidence highlighting the rapid degradation of nutrients in dairy as a result of light exposure. In some instances, nutritional degradation can be as high as 51 percent. Noluma has launched state-of-the-art, patented technology which efficiently tests the viability of packaging against light exposure while advising CPGs on how to design-in more effective barrier protection. 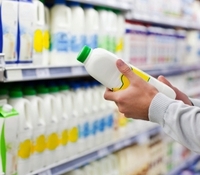 The report, Packaged Foods Should Be Kept in the Dark: Consumers Shouldn't Be, reveals rapid loss of key nutrients such as vitamin A, vitamin D and riboflavin in dairy – in some instances up to 51 percent. It was found that light of any kind, including common retail and refrigerator lighting, degrades a product's freshness, nutrition and stability, leading to faster spoiling. The report also demonstrated that milk can taste or smell worse after just 15 minutes of light exposure. “We've known for generations that light has a negative impact on food. Similar to how clothing fades in the sun or skin is burned, our report shows that a variety of packaged goods are negatively impacted by exposure to lighting of all kinds and far more rapidly than the average consumer realizes,” says Noluma President and CEO Divya Chopra. “Today, consumers expect more from retailers and brands than ever before and assume their favorite products will stay fresh and contain the nutrients promised on the label, through the expiration date. CPGs have an opportunity to work with Noluma to understand how light is compromising their products, and find solutions to ensure they're delivering on those promises,” adds Chopra. Noluma debuted state-of-the-art patented technology last year that measures the ability of packaging to protect contents from light damage with more accuracy and efficiency than existing methods. Noluma scientists use a known marker ingredient in the contents of test package, exposing it to intense light that replicates two weeks of exposure in just two hours. This testing allows manufacturers to better understand the vulnerabilities of their packaging and work with Noluma to design packaging that better blocks the degradation of nutrients, taste and efficacy from light exposure. The extent of damage to the marker correlates with the change in that product's freshness, nutrient efficacy and overall quality. The result is an LPF or light protection factor determined using an algorithm and assigned to each packaging based on the contents it protects. Noluma then uses these learnings to guide the customers in their design of packaging for optimal light protection. Companies who meet the gold standard for reaching the optimal point of light block at which contents are least affected, can add the Noluma logo to their packaging. This certifies that the packaging achieves the best scientifically possible protection from light damage and ensuring that what's inside has the quality, freshness, nutritional elements, potency and sensory qualities promised to consumers. The US-based company analyzed existing third-party studies, commissioned research and new lab testing in order to compile its report on light degradation of consumer products.